Kerasan is one of the most important sanitary ware producers in the district of Civita Castellana (VT). Founded in 1960, it specializes in the production of high-quality bathroom fixtures. Nowadays the company has an international market presence with bathroom collections which include furnishings, accessories and faucets. Kerasan has been producing high-quality products for over 50 years, not only because they want to respond to the demands of the market, but also because they have a passion for producing high-quality sanitary ware which appreciated all over the world. Their passion increases day by day and it is a source of pride for every single person who is a part of this important organisation. This is the mindset that led the company in the past and that will lead it tomorrow. 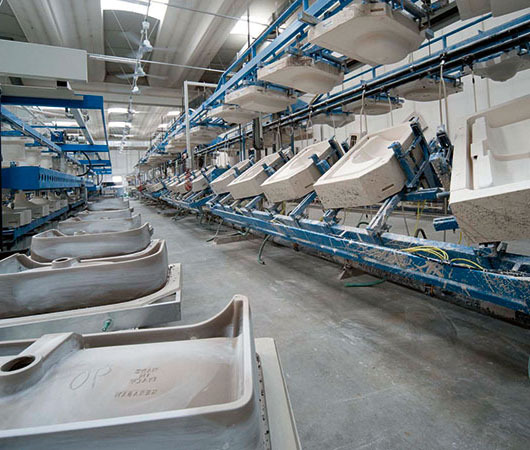 In a modern industrial complex that is spread over about 14,000 square meters, Kerasan performs every stage of the manufacturing process on its premises: from designing bathroom fixtures, to realising the design and finally, production. Thanks to a facility with a production capacity of up to 1000 pieces of sanitary ware per day and an advanced modelling department, in which cutting-edge software are used to reduce time and make the development of the prototype and the mould easier, Kerasan satisfies all the needs of the customer.